Professor Bert Meijer. Photo: Elodie Burrillon. 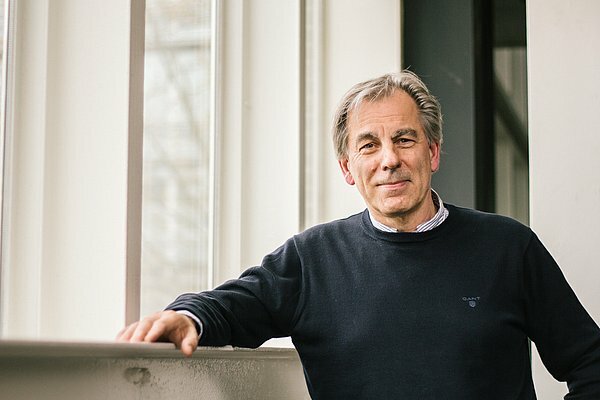 Bert Meijer, professor of Organic Chemistry at TU Eindhoven, will receive the Nagoya Gold Medal on 22 December. The prize is awarded to the world’s best scientists of organic chemistry, a major discipline within the chemistry field. Meijer thereby joins a line of 22 illustrious predecessors, including winners of Nobel prizes, Benjamin Franklin Medals and Wolf awards. Supramolecular chemistry focuses on relatively weak chemical bonds that appear or disappear in response to, for instance, a rise in the temperature or acidity level. These supramolecular bonds enable the development of materials with chosen behavior. Supramolecular compounds are also an essential component of life itself. Meijer, therefore, tries to fathom how life functions and is created at the molecular level, so that the insights gained can be used to develop new materials for medical applications, for example. The results of Meijer’s work have already found their way into applications in a wide range of domains. One that springs to mind is the widespread use of the modular supramolecular material developed by Meijer, and based on ureidopyrimidinone (UPy), in regenerative medicine. It serves as both the mould and controller at one and the same time for the formation in the body of new human heart valves and blood vessels from the body’s own cells. But in wholly different domains UPy is also beginning to prove its worth, as in self-repairing plastics, wearable electronics and even in make-up and other cosmetics. Bert Meijer is the founder of the Eindhoven Institute for Complex Molecular Systems (ICMS). He has won several highly reputed awards, including the Spinoza award in 2001, the ACS Award for Polymer Chemistry in 2006, the AkzoNobel Science Award 2010, the International Award of the Society of Polymer Science Japan in 2011, the Cope Scholar Award of the ACS in 2012, and the Prelog Medal of ETH Zürich in 2014, the same year in which he was appointed by the KNAW as Academy Professor, which is intended as a lifetime achievement award. Furthermore, he has been instrumental in two Gravitation programs: Functional Molecular Systems (honored in 2012, subsidy of 27 million euros) and Materials-Driven Regeneration (honored in 2017, 19 million euros). In this recent video professor Meijer talks about his drive and ambitions.